Category: SF short-fiction anthology. How-to-write. This is a good, but not great, anthology of SF stories, with a few pages of commentary after each piece. The anthology's main strength is the diversity of authors and story styles/voices, as well as the mix between older classic stories and more recent work. The analyses are interesting and occasionally revealing, but I didn't find them as consistently insightful as I'd hoped, mainly because they tend to speak in generalities about the sub-genre of SF represented by a particular story. While this is useful for learning about SF's sub-genres, and the approaches that tend to work best within them, it's not necessarily very conducive to lessons in craft or technique. I'm glad I read Niven's "Neutron Star," which I'd heard much about; it held up well to my high expectations. Cadigan's "Rock On" was punkishly charming (though not happy, by any means) but didn't reach me emotionally. "Transstar" was the only story I've ever read by Raymond Banks; though not a very demanding or complex tale, it was solidly executed, and highly readable. There was something almost vicious about its directness and moral simplification. Ballard's "Billenium" feels a little dated, and stretches a predictable sociological point over-thin. I prefer his more aggressively New Wave "compressed novels." I didn't particularly enjoy Schmitz's "Grandpa." Cox's "In the Circle of Nowhere" was a pleasant surprise, a well-handled excursion into Native American alternate history. I could hardly get through Fontenay's tale. The discussion states that "it fits the overall profile of a science fiction quest adventure shaped to the interests and attitudes of a teenaged (and probably male) readership." That's fine; I am not inherently opposed to that sort of thing. But as the comments also point out, "the aliens are generalized" and they seemed over-generalized to me. The conclusion was foregone, sure, but I wished I could have encountered more world-building detail on the way there. I had read Clarke's "Dial F for Frankenstein" before and had utterly forgotten it. As noted, "...the story is a dialogue less between given characters than between thesis and hypothesis." Since the idea doesn't seem particularly startling or ingenious, the resulting expository exploration becomes pretty disposable. That leaves the two stories I absolutely loved, both of which I had read before, and multiple times: Asimov's own "The Last Question" and Spinrad's "Carcinoma Angels." Though these are completely different in subject matter and approach, they both share the quality of relentlessness. The shape, time-scale and scope of both narratives is determined entirely by the struggles they chronicle: in Asimov's, humanity's, and eventually the entire Universe's, battle against thermodynamics itself, and in Spinrad's a single individual's attempt to vanquish his own inner cancer. 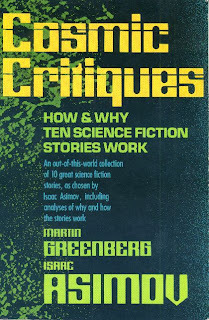 For a complementary anthology for would-be writers more focused on craft and aesthetic, and with more consistently high-caliber stories, I recommend Robert Silverberg's SCIENCE FICTION 101.